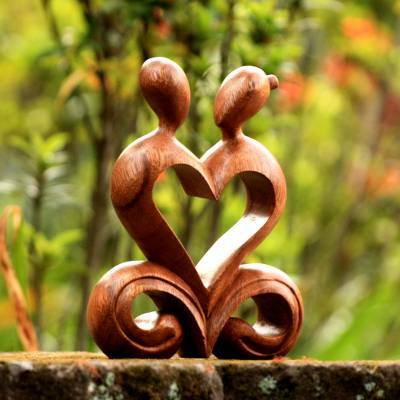 Handcrafted Romantic Wood Sculpture, "One Heart"
A couple leans close to gaze into one another's eyes. Their bodies meld to form a heart. "This sculpture symbolizes eternal love," Balinese artisan Nyoman Karsa confides. He carves the signature piece from sleek suar wood. "one of the best wedding gifts I have given"
This lovely and deeply symbolic sculpture is beloved by my sister and now brother-in-law. Beautiful work, I was proud to gift this. THIS WAS A PRESENT FOR MY SWEETIE ON VALENTINES DAY, HE WAS PRESENTLY SURPRISED. HE THOUGHT IT WAS PRETTY COOL. Sent this to my daughter and she was amazed at how beautiful the piece is. This will be a cherished item in our newlyweds home for all the years to come. Beautiful work of art!